Obon and Family Values – An interpretation of the contemporary meaning of the Obon Festival that commemorates the ancestors in Japanese Buddhism. NOTE: The following essays, articles and papers are in Adobe Acrobat (pdf) format. Buddha: The Perpetual Iconoclast – There are many facets of Buddhism. However, the essence of Buddhism, which distinguishes it in some ways from other religions or religious philosophies, may be called iconoclasm. Introduction to Religion in China and Japan… The following chapters are taken from the volume “Religion and Man; India and Far Eastern Religious Traditions,” by Alfred Bloom (New York: Harper & Row, 1971.) pp. 139-282. They are included here to provide a background for Buddhism in East Asia, and offer some information on the meaning and significance of the religious faiths of China and Japan. Globalization and Buddhism – An exploration of globalization, from the HAIB Newslettter. Introduction to Pure Land Tradition – A general presentation of the Pure Land tradition relative to texts, doctrine, development in Japan, Shinran. The Foundation of Shinran’s Faith: Supremacy of the Vow in the ‘Tannisho’ – Lectures on the “Tannisho, Notes Lamenting the Deviations,” an important Shin Buddhist text giving seminal insights of Shinran. 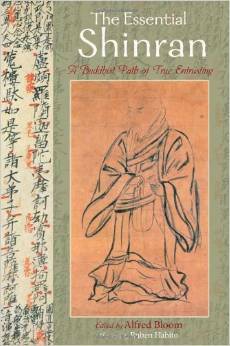 The Life of Endowed Trust – Sermon, on nature of faith and trust in Shin Buddhism. Buddhism in a New Age – Shin Buddhism faces a new age of technology and society. It challenges us for our future activities. The Unique Potential of Shin Buddhism in Western Society – A brief essay on the meaning of Shin Buddhism for modern people. Kyogyoshinsho – Foundation and Resource for Shinran’s Understanding of Nembutsu – Introduction to the “Kyogyoshinsho.” An essay on Shinran’s major text as a resource for understanding nembutsu. The Ultimacy of Jodo Shinshu – Shinran’s response to Tendai, the reigning system of thought of his time. Shinran’s approach reflects his creativity in confronting contemporary thought in his own age. Rennyo and the Renaissance of Contemporary Shin Buddhism … This two-part essay introduces Rennyo (1415-99), the eighth Abbot of the Shin Buddhist Denomination, who is commonly called the “Restorer” of Shin Buddhism. Part 1 – The Life of Rennyo. Part 2 – Rennyo’s contributions to the development of Shin Buddhism. Parallel Recognitions of Honen and Rennyo in the Development of the Pure Land Movement in Japan. – This essay indicates the heritage from Honen underlying the achievements that became evident in Rennyo through the composition of the “Senchakushu” (Jodo Shu reading, “Senjakushu” in Jodo Shinshu). Obon Festival … Living and Dying in Buddhism – Further reflections on Obon.